Make sure that students are open to the google chrome browser. Students can log in at visionofyou.org and then type in the user name and password that you have given them. Note: If a student forgets their password they will need to ask you to give it to them again. There is no password reset within the program. Once students’ log in in they will be brought to their profile page. To begin, students simply click on one of the units that is unlocked and then a topic within that unit and they will be brought to their first activity. They can continue by choosing any topic that is unlocked. As students complete different topics and units other topics and units will unlock. Students can use the question box to ask any question about sexual health, relationships, or other questions to the curriculum. A trained sexual health educator will answer their questions. Students will select an avatar that they will engage with throughout the curriculum. Students can read the story of each avatar to see which one they can most identify with or relate to or are interested in seeing how their story unfolds. 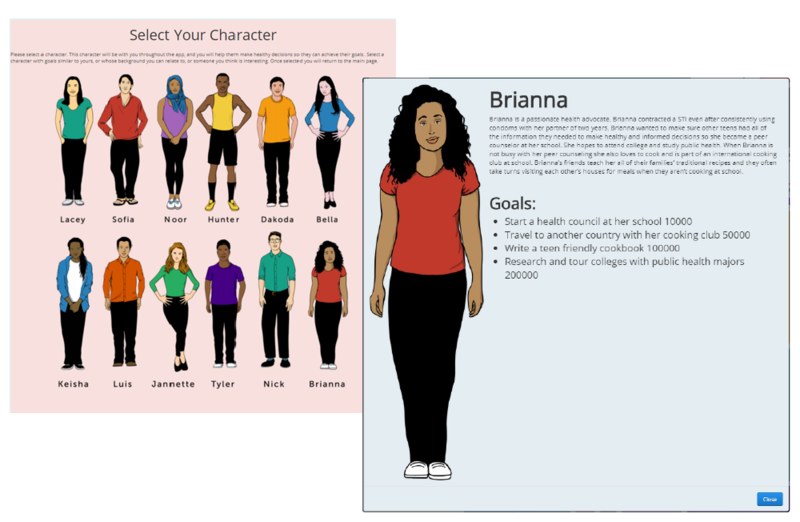 Throughout the curriculum students will learn more about their avatar, help their avatar achieve their goals through engaging with the curriculum, and answer real life scenario-based questions for their avatar. The avatar that students select will be located on the landing page when students log on. There are five infographics throughout the curriculum. Once a student engages with the infographic within the curriculum they can refer back to it at any point on the landing page. The bar of icons beside the points are where students can find them. They are easy to identify as smaller versions of the infographic. As students’ progress through the curriculum they are able to earn trophies as they complete different activities or units, earn points, or help their avatar. Students can choose three of their trophies that they would like displayed on their home screen. Units will unlock as other units are completed. If there are multiple items unlocked at once students can choose the order in which they proceed through the program. At any point students can refer back to their infographics, avatar, or ask a question.